Without a doubt, the most wonderful, unique, or amazing ideas are usually frustratingly fickle and fleeting. One minute, they enter our brains like a delightful spark of dancing light, only to dissipate into thin air moments later. As a creative writer, you need to be able to ensnare these inspirational tidbits before they are gone and one of the best ways to do this is to keep a notebook handy at all times. That way, whether you're commuting on the train in the morning or snuggled under the covers at night, you can make sure you never miss another fabulous brainstorm. However, capturing ideas isn't all carrying a notepad can do for you as a writer. Check out the other benefits to keeping a notepad with you. 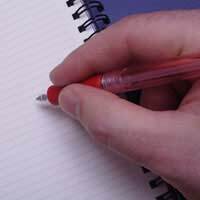 As a writer, you need to be disciplined in order to increase your writing acumen; not surprisingly, a notebook can assist you in becoming more consistent because you'll be writing on a regular basis. By diligently recording observations and thoughts that might generate future stories, poems, song lyrics, or play scripts, you'll become a more self-directed writer, important if you expect to produce a higher quality and quantity of creative works. An added benefit to this kind of personal discipline is that you'll be more naturally able to meet (and exceed) editorial deadlines and expectations. If you're consistently penning all your thoughts and story concepts, you'll soon discover that writing will come easier. Your words will more naturally flow from your head onto the paper and you'll have a better command of vocabulary as well as grammar. Not only will this result in your being able to create more stories, poems, or plays; it will also lead to a better quality of writing. If you expect to become a professional writer (i.e., make a full or partial living by selling your works), having an excellent and impeccably "clean" writing style is critical to your chances of succeeding in a field that's notoriously competitive. Many novice writers make the mistake of waiting for inspiration to tap on their shoulders; thus, rather than writing, they essentially twiddle their thumbs, longing for an invitation to create. By keeping a notebook, you'll be able to generate your own inspiration and fundamentally become your own "muse". When you're feeling a little worn out or empty of new ideas, all you'll have to do is look through your notebook or journal to refresh your mind and turn on your creative juices. The only way to get better is to make errors once in a while and your notebook is the perfect place to do so! Since you're most likely the only person who will be looking through your scribblings, you can feel free to make missteps. This is an important development in your progress as a creative writer, because the only way to get better is to break out of your comfort zone, which means allowing yourself to stumble before you can soar. Even if you're not entirely convinced that keeping a notepad is for you, why not go out there and buy a small notebook anyway? Journal in it regularly for three weeks, then decide whether you've found the experience to be beneficial. Chances are, you'll wonder how you ever wrote without it!